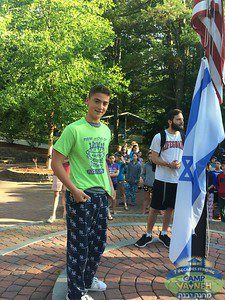 Leviim Highlights – 4th of July, Achla Yom and Birthdays! Monday kicked off with a celebration of Yoni Semel’s birthday! We has ice cream, cake, a chance to play on the kangaruach, and a chance to celebrate with all of our friends. Our peulat erev (evening activity) that night was, quite appropriately, a birthday bash with the other aydot (age groups) of upper camp. Each birth-month competed to see which month was best, through videos, skits, and songs. 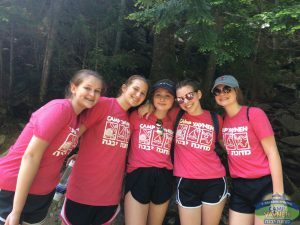 ur beloved madricha (counselor) Sarah Mlotek. The talent show ended with an exciting and freedom-inspiring display of fireworks, followed by a screening of the movie Trolls, complete with soda and popcorn. But the fun doesn’t stop there! Also on Tuesday, our chanichim found out that we would be heading to the Appalachian Mountain Club Highland Center on Wednesday! 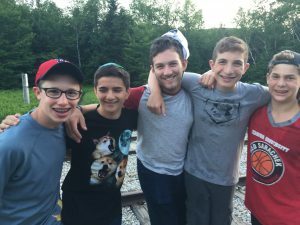 The Highland Center is a highlight of Levi’im summer for many chanichim, so even though the plans were sprung on them suddenly, our chanichim tookeverything in stride. After packing up and loading the buses on Wednesday morning, we headed up the White Mountains to the Highland center. After arriving, we ate lunch and headed out in groups on six to different hikes, various waterfalls and mountaintops. After returning, all of us were wiped. So we showered and relaxed for a little while before having a delicious, Yavneh-cooked aruchat erev (dinner) and a medurah (bonfire). We will be spending Thursday and Friday at the Highland Center as well, hiking, learning outdoor skills, and bonding together as an aydah. We can’t wait to tell you all the details of the trip on Monday.